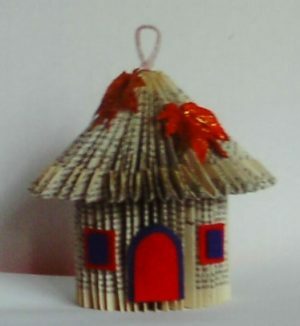 Turn a paperback book into a birdhouse. It’s not magic. It’s book origami! OSWEGO – Fold a paperback book into a birdhouse during book origami, a “Learn To” session at the Oswego Public Library on October 29 from 5:30 to 7:30 p.m.
Instructor Chris Koagal of Red Creek, owner of a handcrafted gifts and novelties business, recommends this class for those eight years and older. All materials for the class will be provided at the library. To reserve a place in this “Learn To” class, sign up at the front desk in the library, or call 315-341-5867.